Exiled from her home, the enclosed city of Reverie, Aria knows her chances of surviving in the outer wasteland – known as The Death Shop – are slim. If the cannibals don’t get her, the violent, electrified energy storms will. She’s been taught that the very air she breathes can kill her. Then Aria meets an Outsider named Perry. He’s wild – a savage – and her only hope of staying alive. A hunter for his tribe in a merciless landscape, Perry views Aria as sheltered and fragile – everything he would expect from a Dweller. But he needs Aria’s help too; she alone holds the key to his redemption. Opposites in nearly every way, Aria and Perry must accept each other to survive. 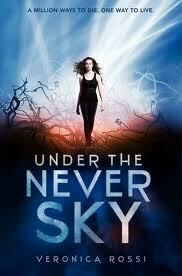 Their unlikely alliance forges a bond that will determine the fate of all who live under the never sky. You guys have no idea how long this book was on my list. I mean, seriously. I wanted this SO MUCH when it first came out, and I was ecstatic to have finally gotten it after hearing such great things about it. So you can imagine my frustration with the entire first half of this book. The biggest issue for me was the amount of unexplained exposition. I kept having this feel of being THIS CLOSE to falling head over heels for this book, just as soon as a few more things made sense. However, it seemed like every time I approached that precipice, I was attacked with more words that I was supposed to figure out on my own. “Blood-Lord,” “Scire,” “Aether storms”–that’s only the beginning of the strange words. Actually, I felt like I was being taught to read Shakespeare all over again, hearing my teacher say “Now, if you don’t understand the word, read the words around it and see if you can infer its meaning.” I can usually forgive this in a book somewhat, if I’m enjoying the read, but this continued until almost exactly half way through. The characters of Aria and Perry aren’t exactly stellar in the first part either. Aria seems to be devolving into your typical cliché female heroine and Perry is having a bipolar characterization where he isn’t sure if he should kill his brother and take over his tribe or leave his tribe altogether because he doesn’t want to hurt anyone. But then you reach that almost exact middle point of the book. On one page, you have Perry thinking that menstruation smells like violets. On the opposite page (the book switches between Aria and Perry’s POVs), you have Aria freaking out because she can now “conceive at random.” I stared at these pages for a good long time wondering just what in the world was happening. Then I turned the page, warily. And the book got exponentially better. Aria and Perry become likeable characters. Aria shows you that she isn’t a whiny, helpless girl, but she isn’t obnoxious (too much, anyways) either. Perry gets more depth, and you begin to understand him (and his tribal structure, thank goodness) so much better. Add in Perry’s best friend Roar and the interesting and there-for-too-few-pages Cinder with his AWESOME power, and you’ve got a fantastic mix of characters and story that flows along so much better. You then, of course, proceed to have some YA romance, but it honestly wasn’t so bad. Aria and Perry do take the chance to get to know and trust each other before deciding they love each other, which made me absolutely delighted. It was decidedly real. Until the last few pages of the book, which made me roll my eyes, but also made me want the next one NOW. So, you know. Overall, I did enjoy this book. Perhaps someday I’ll reread it a few more times and see if I can get some more understanding out of the first half. The world, the characters and the story throughout were wonderful, it was just in the second half that they were fantastic. Fans of dystopian should be aware that Under the Never Sky would have possibly been more appropriate with a sci-fi label, because it’s very easy to forget this is supposed to be our Earth we’re reading about, but I really liked that. You can bet I’ll be reading the sequel! Reblogged this on Under The Never Sky Philippines.